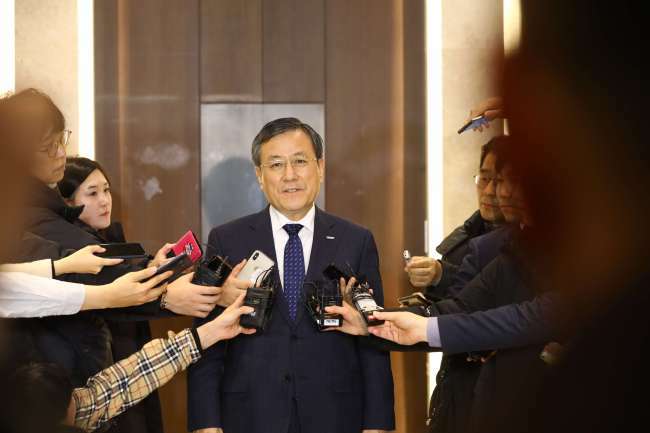 KAIST, South Korea’s top science and technology university, on Friday decided to delay its decision on dismissing its incumbent President Shin Sung-chul, who has been accused by the government of mishandling public funds during his previous post at another university. KAIST’s board said it will reconsider the dismissal of the president at the next board meeting, given the gravity of the issue and continued dispute over the accusations by the Ministry of Science and ICT. The ministry alleges that Shin mishandled public funds while serving as the president of the Daegu Gyeongbuk Institute of Science and Technology from 2011 to 2017, before joining KAIST. The allegations center on DGIST’s payments to Lawrence Berkeley National Laboratory in California, as part of a deal in which scientists at Korean universities were given access to one of LBNL’s imaging equipment. The Science Ministry asserts that the payments -- 2.2 billion won ($1.9 million) -- were not a part of a 2012 agreement between DGIST and LBNL and were transferred in a separate arrangement, violating regulations. The ministry also alleges that some of the money was paid to an individual who was a former student of Shin’s, in what could amount to embezzlement. It has referred the case to the prosecution and asked KAIST to dismiss Shin. Shin has denied the accusations, and the science community has acted in support of Shin. On Monday, the LBNL sent a letter to the ministry explaining that the agreement was legally executed. KAIST’s physics department, where Shin worked from 1989 to 2011, has also drawn up a petition claiming that moves to dismiss the president lack due process as they are based on unproven accusations and an ongoing investigation that has yet to conclude. Some researchers view the KAIST case as a part of a political purge against public science institutions by the Moon Jae-in administration. Shin assumed his post under former President Park Geun-hye, who was impeached and imprisoned for corruption, abuse of power and embezzlement.